Say We Can Fly lifts off! For almost a year now I have been getting to know Singer/Songwriter Braden Barrie from Say we Can Fly. In an incredibly short amount of time his writing has grown in terms of musical and lyrical depth. It is my personal opinion that he introduces a pleasant change to a popular style. Enjoy! I have been writing since I was about thirteen. I wrote a few riffs on guitar while I was still in elementary school, but I remember writing my first song with lyrics right before highschool hit. What influences you to write music? My biggest musical influence has definitely been Christofer Drew from NeverShoutNever. After I found his music on PureVolume, I started really getting into writing. I also looked up to him because of the way he went about things. I have strayed away from his music, and gone off on my own. I don’t listen to alot of music, so most of the inspiration for my songs just comes from people I know or things that happen in my life. Your recordings are very clear and well put together, do you spend a lot of time in post-production? Generally when I record home demos, I just use an 8 track mixer/recording box. When I first started out I didn’t ever use a computer to edit anything. Recently though, I use a computer to normalize tracks and add reverb. I usually spend 1-2 hours in post production per song if I use a computer at all. I’ve been watching a definite growth as a musician from you, what direction do you think you’re headed? 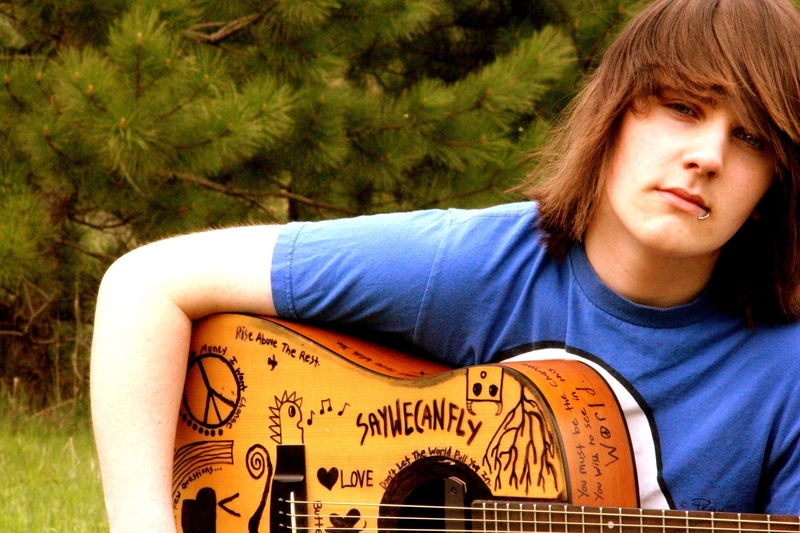 I’ve been doing SayWeCanFly for just about a year now, and I still feel a little lost about it. The direction I want to head in would definately be touring around and playing my music for kids, and making sure they hear it. It’s not so much about the money for me, it’s more important that my music gets out there. If I could tour and make enough money to eat and keep touring, I think I’d be happy for quite a while. Is there a pattern to your writing? Or is it spontaneous and different every time? My writing is absolutely random. If I think of a line that sounds interesting to me, I grab my guitar. I usually don’t sit down and have writing sessions, I just build a song around a line that sticks out to me whenever it pops into my head. Any big news or big breaks? The message I try and get across with my music is usually simplicity, and that there is beauty in the smallest things. Songs like Cozy Hour and Super Moon just show that even things like an hour of the day and the moon can make someone happy. I sort of grew out of the whole generic “peace and love” phase, but in a way I still keep that in mind when I write.